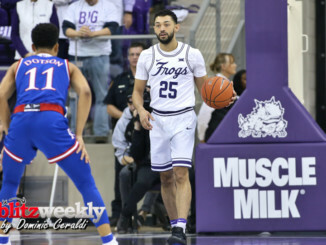 Trailing 2-0 in the match, the TCU volleyball team staged a comeback and were able to take the win in three straight sets to get the 3-2 (18-25, 25-27, 25-21, 25-23, 15-7) victory over West Virginia in front of a sold-out crowd on Thursday night to wrap-up the first half of Big 12 Conference play at The Rickel inside the University Recreation Center. 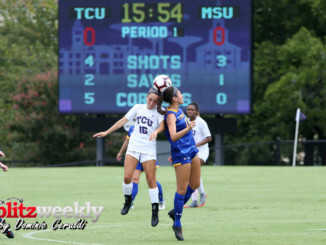 The Horned Frogs (12-7, 4-4 Big 12) had to regroup after falling behind in the match and used senior leadership from Anna Walsh and Lexi MacLean to ultimately get the victory over the Mountaineers (9-11, 1-6 Big 12). TCU never gave up and used strong serving and blocking to jump out to early leads in the third and fourth set. WVU would attempt to close the gaps, but the Frogs continued to control the sets in order to force the decisive fifth set. TCU was nearly unstoppable in the final frame with nine kills and only one error for a .421 hitting clip as they completed the comeback. Walsh paced the offense with a season-high 24 kills and was just shy of a double-double with a team-best nine blocks while MacLean led the defense with 24 digs. Allye Beth Deaton scored her first double-double of the season with 15 kills and 18 digs while Katie Clark finished with 13 kills. Tori Dilfer recorded her own double-double of 55 assists and 13 digs with Berklie Baker and Dani Dennison chipping in on defense with 21 and 11 digs, respectively.